Walking Bass line resources - lessons, transcriptions, walking bass line books. Complete walking bass line collection from Constructing Walking Jazz Bass Lines featuring jazz walking bass line lesson material , walking bass line examples and jazz bass playalong backing track material. I bought Constructing Walking Jazz Bass Lines books I, II, III & IV. They are all fantastic. The bass lines sound great. The concept of having the facility to play tunes in all 12 keys is fantastic and Steven Mooney's instruction is invaluable. Highly recommended! I bought three of Steven's books - this one, "Blues in 12 Keys", and "Rhythm Changes" - and they are all excellent. The theory of bass line construction is clearly presented, but more importantly (to me) there are enough examples to put the theory in a musical context. Getting from one chord to the next is only the beginning; a really good bass line has a theme that is developed over the whole form of the song. The examples in these books are really good for that. I feel like my vocabulary has gotten bigger and my lines are sounding much better already, and I'm barely halfway through the book. If you are an absolute beginner this book might be too challenging, you might want to start with Ed Friedland's book instead. But for an intermediate player (or a brave beginner) there is a lot here that will really help you get to the next level. For less than the price of one private lesson, it's a no-brainer. Buy it. I am highly recommending Steven Mooney's method for Constructing Walking Bass Lines Book I The Blues in 12 Keys, Book II Rhythm Changes in 12 Keys and Book III Standard lines which I purchased mid July and I am eagerly awaiting Book IV. If you can read music a little bit or read TAB, this is the Method for YOU. Steven's approach is masterly crafted to ensure that you are playing strong Bass Lines right out of the Gate in all Twelve Keys with numerous exercises to reinforce each and every concept whether Theoretically and/or Harmonically in a very Comprehensive and Progressive approach including clearly written directions of the various concepts for the thoroughly written out exercises. As we all know, we all learn by doing. Steven's method provides numerous exercises to keep each and every aspiring Bassist enthuse about Learning and Creating Walking Bass Lines. I have worked with literally over twenty different method books and Steven Mooney's approach is definitely the best of the best that I have worked with. It is very player friendly throughout and it is masterfully crafted! In addition to a lifetime's work going into creating these books more importantly is the willingness to patiently share this knowledge with others that makes all the difference and Steven should be very, very proud of that accomplishment. In addition I am truly having the time of my life with these books and I have only just begun!!! So many varied exercises to reinforce the concepts, techniques and sight reading among others! Moreover, it is a lot of FUN! Steven SHARES the Mysteries of Understanding and Creating Melodic Walking Bass Lines. I personally find it challenging to stay away from his books but I know I should actively be working on Simandl, Ray Brown, Rufus Reid, Harvey Vinson, John Goldsby, Chuck Sher, Ed Friedman, Bunny Brunel, Bob Magnusson, James Jamerson and Jamey Aebersol methods as well!!! Book three of Constructing Walking Jazz Bass Lines has a more theoretical approach to the book than the previous two volumes. Part 1 focuses on the theory needed to play jazz standards. It covers everything from modes and chord scale relationships to voice leading and approaches for application within a progression. Part 2 focuses on symmetrical scales and melodic minor scales. Part 3 focuses on the use of bebop scales. The first 3 chapters show many of the different scales and modes used in jazz. After an explanation of how each of these functions within different jazz chord progressions, examples are given that demonstrate the practical use of all of these devices. The final chapter gives the player numerous examples of common jazz progressions labeled under witty titles based off of the original tune name such as "Slipped into a Dream" or "No ones here." Each example demonstrates applications of the various scales and modes learned in the previous chapters. This book covers all angles that can be used in creating a walking bass line for any tune. It is direct and easy to comprehend. Any advancing bassist should take a look at Constructing Walking Jazz Bass Lines. An excellent book that focuses on learning by playing the changes and internalizing the patterns. Steven Mooney presents you with the basics of how to play through ii-V7s, or diminished chords, or some other topic, and then gives you plenty of exercises that feature the patterns and cadences the bass player will actually encounter in playing through the standards. Working through Mooney's books on the blues, rhythm changes, and standards is a great way to learn to play jazz bass. An "Absolute must have" Hands down!! The Constructing Walking Bass line series delivers on how to walk the walk and talk the talk -Constructing Walking Jazz Bass Lines, Book 3: Walking Bass Lines- Standard Lines in 12 Keys Upright Bass and Electric Bass Method [Paperback], and all of Mr Mooneys Series. Prepares any bassist to compete in the highly competitive music business as a Jazz Bassist. My hat goes off to you Sir, your text should be reguired reading for any aspiring bassist. major scale". Mr Mooney walks the reader through that subject detailing both the notes for the triads used and a nicely done example. Mr Mooney also goes into depth here by explaining chromatic approaches walks up and down. In the next section, we find the Scalar approach, which details the technique for the bassists usage of using scales as a foundation as opposed to triads. Part 2 outlines the use of Symmetric and Melodic Minor scales. Diminished and Whole tone scales are covered for the avid reader. Part 3 covers Be Bop Scales. Is Hip Hop the grandchild of Be Bop? Someone should answer that burning question, but I don't expect Mr. Mooney to do so. He applies himself quite well to the serious subjects at hand. Part 4 is Jazz Bass line examples over Standard Jazz Chord Construction. In this section we find exercises for the bassist that are both challenging and therefore interesting for all bassists. Mr. Mooney's latest book is a must read for all of us who ply the "Dark Strings". I keep opening all three of his books for education and fun playing. I'm sure you will also. After deciding last year to focus on jazz as my main genre, I ordered Steven's books after reading the preview pages. Though walking basics and theory aren't new to me, book 1 lays a solid foundation. For those who have gone through other walking books such as Ed Friedland's. Many of the concepts will be familiar to you, Steven goes into a little more detail. Having fully written lines, you're able to see and analysis how and why the lines work. Which goes a long way when writing out your own lines or using chord charts. I also appreciate that the first section is centred around one key. It has helped me adjust to my fret-less again. The use of different rhythmic variation is a good touch as well. Part 2 of the book and working through all twelve keys can be quite a task. It has helped me brush up on my sight reading, something I haven't actively done for many years. If you can't read standard notation, TAB versions are also available, which sets the book apart. The available MP3 backing tracks are also a great tool. I like the fact they quite long, allowing you to more easily put things into practice. Overall I'm very impressed with the series so far. I would highly recommend book 1 to anyone who's interested in jazz. For those like me who have used Friedland's book. I feel Steve's are an excellent continuation of knowledge. For absolute beginners or those without basic music theory. Things may be a little more challenging at first. The official website has a forum, where you can sign up and get help from Steven himself and the other members. I can foresee using the book for years to come. Keep up the good work Steve.. looking forward to the release of book V.
Book one of Constructing Walking Bass Lines focuses on the blues. It's a great starting place for the beginning jazz bassist. The first chapter covers over a dozen ways to approach a walking bass line. Numerous examples of these devices are given throughout the chapter while incorporating basic jazz theory and examples of smooth voice leading on the instrument. The second chapter simply makes practical use of all of these techniques combined within the blues in every key ascending chromatically. The bassist will not only build endurance and facility in every key from these exercises, but will also develop their own sound on the instrument. This book demonstrates many ideas and techniques that could be an impetus for developing ones own sound. It is unrestricted, leaving the player to his or her own creativity while providing a basis of support to the soloist. I would recommend this book to any bassist interested in jazz. It is the perfect tool for the advancing bass player or for music educators with talented young bassists in their band. Soy contrabajista aficionado y autodidacta ,y llevo años buscando buenos libros.Como es lógico lo mejor siempre está editado en inglés, hasta que me encontré con esta completísima colección.Empieza como es debido, el blues, los rhithm changes, y continúa por una completísima descripción de las principales progresiones y la correspondencia escala/acorde, además del uso de cada escala.Un 10 en armonía de jazz práctica.Y lo mejor de todo,en la mayoría de métodos se limitan a recordarnos la eterna premisa de "en las 12 tonalidades...", pero en esta colección nos desarrollan ejemplos en cada una de ellas.Muy práctico para aquellos que ya saben lo que necesitan estudiar, y fácil de entender para quienes empiezan. Además ,al principio de cada tomo nos recuerda las diferentes técnicas para montar un walking de forma progresiva, con lo que no necesitamos tener todos los volúmenes.Aunque yo lo recomiendo, cada uno complementa a los demás para completar una estupenda obra. Here you get simply the best on market, if you are interested learning and understanding the art of creating functional and logical Walkin Jazz Bass Lines. I have all four books in the bass tab edition (good thing), and each one gives you a really solid foundation in an easy and practical way. Every aspect of Blues, Rhithm changes, Standards and Jazz Progressions is analysed in great detail, offering you all the things you must know to feel comfortable in almost any Jazz situation. The Playalongs (many!) sound great too and it's really fun to play with!!! This book had a lot more information and was way more advanced than I expected. It's the most comprehensive jazz bass book I've found to date. I've been working out of several books for the last year or so, but this is going to be my focus for the foreseeable future. I will definitely be getting the others in the series. An "Absolute must have" Hands down!! The series delivers on how to walk the walk and talk the talk -Constructing Walking Jazz Bass Lines, Book 1: Walking Bass Lines- The Blues in 12 Keys Upright Bass and Electric Bass Method [Paperback], and all of Mr Mooneys Series. Prepares any bassist to compete in the highly competitive music business as a Jazz Bassist. My hat goes off to you Sir, your text should be reguired reading for any aspiring bassist. I am very happy to offer this review of Constructing Walking Jazz Bass Lines BK II. I have had the opportunity for individual lessons with Mr. Mooney, where I was introduced to his books. Bottom line is this is what you need if you wish to become proficient with the instrument and genre. This is, in my humble opinion, the material you need to have under your hands if you want to be able function successfully as a bass player. It is not easy, but nothing of value ever is. This is for the dollar the best investment you can make in fundamentals that you will use for the rest of your playing career. I was a student of Steven Mooney's at the time this book was published. I am what you would call a serious amatuer player, and had struggled for years to understand the material that is presented in this book. Let me tell you, the other reviewers are 100% correct, and Steven is a master at presenting this material in a context that is logical and easy to understand. If you understand the material presented in Book I you will be able to write effective lines and function in the role of a jazz bassist. His guidance has changed my playing and understanding of music, and allowed me to play at a level I would not have thought possible a short time ago. This is money well spent for a foundation you will use as long as you play the instrument. If you are an absolute beginner this book might be too challenging, ~ for an intermediate player (or a brave beginner) there is a lot here that will really help you get to the next level. For less than the price of one private lesson, it's a no-brainer. Buy it. I bought three of Steven's books - this one, "Blues in 12 Keys", and "Jazz Standards" - and they are all excellent. Lots of introductory method books show what to play in a single measure to get from one chord to the next, and that is a good place to start. But the next step is to create a line that is melodic and interesting over the whole song form. That's what these books do really well. The underlying theory is clearly presented, and the transcribed lines show how to put the theory in a useful musical context. If you are an absolute beginner this book will be pretty challenging; ~ if you have some basic familiarity with walking bass lines and want to take your playing to the next level, this is the book for you. Well worth the price. I bought three of Steven's books - this one, "rhythm Changes", and "Jazz Standards" - and they are all excellent. Lots of introductory method books show what to play in a single measure to get from one chord to the next, and that is a good place to start. But the next step is to create a line that is melodic and interesting over the whole song form. That's what these books do really well. The underlying theory is clearly presented, and the transcribed lines show how to put the theory in a useful musical context. Well worth the price. I am currently learning upright bass and learning to read music - this is the perfect book. I have created the chords behind the exercises in GuitarPro and it has really helped me to get a good understanding of jazz bass lines. I have looked at many books out there, but this really is the best I've come across. The 12-bar blues and "Rhythm" changes (coming from "I Got Rhythm") are two of the fundamental building-block progressions in Jazz. Together, they form a basis for understanding much of Jazz. These progressions, or portions of them, are used again-and-again throughout the Jazz repertoire. Yet, it is nice that so many variations are given on the basic A-part of the Rhythm Changes progression, since that is the way it really gets played: not just the same lines repeated over-and-over. I am particularly pleased that all the examples are completely written-out note-for-note; whereas in many books by other authors, an example will be given in one key with the other keys being left up to the student to figure-out! I always found that to be extremely frustrating. Writing-out all the bass lines instead of just the chord symbols lets the student learn the actual melodic motion of bass lines in the way that they are really used. The use of scale-type phrases, chromatic lines, occasional wide interval leaps, and rhythmic variations (such as quarter-note triplets and dotted-eighth/sixteenth notes) ...in full context... really puts it all in proper perspective. It shows how those devices are actually used! That's the stuff people learn-from through specific examples! Then once the student becomes familiar with it all and gets the hang of it, he or she should be able to call on these ideas in increasingly improvisational and hence musical ways. The books will be very useful in learning these specifically important Jazz progressions in every key, which practically every Jazz teacher tells me I should do! Many years of Jazz music-theory training gives me enough insight to recognize that the given examples will be very useful tools in gaining a good grasp of the melodic nature of walking bass lines. Additionally, the appearance and lay-out are comfortable to look-at, which makes it all easier to read; and I like the Jazz fonts! "Constructing Walking Jazz Bass Lines, Book 1, The Blues in 12 Keys: A Comprehensive Guide To Constructing Walking Jazz Bass Lines for the Double Bassist and Electric Jazz Bassist" is a complete 12-key guide to techniques and devices used to construct walking jazz bass lines in the jazz tradition. Part I, the Blues in F, presents exercises and techniques known to help create robust jazz bass lines, moving forward while retaining a solid rhythmic, harmonic foundation. Part 2, The Blues in 12 Keys, expands further the lessons of Part 1, providing previous techniques and devices used in professional level bass lines in all 12 keys. The practical and ambitious aim of "Constructing Walking Jazz Bass Lines" is "to give the aspiring bassist a solid grounding in understanding how to construct walking Jazz Bass lines and support a melody and or soloist (p. 97)." The Book concludes with sage advice, "Listen to as much music as you can, Listen to the masters (p.97)." Included is full notations with enharmonic chord symbols for more than 150 choruses of jazz blues lines in all 12 keys, using the whole register of the instrument. "Constructing Walking Jazz Bass Lines Book 1" is an invaluable resource to the aspiring jazz bassist, with potential for learning teaching and great practical application. First of all, the title is a bit of a misnomer. Yes, there are transcriptions of Blues in all twelve keys. The transcriptions are 3 to 5 pages each. But what the beginning to intermediate bassist will find most usefull are the 33 pages, at the beginning of the book, demonstrating the various devices that Jazz Bassists use to construct effective bass lines. The Advanced player will welcome the books interesting exercises to use for keeping the chops up. Steven Moody, the author, guides the reader through exercises including Chromatic Approaches, Dominant 7th Chords, Harmonic anticipation, Voice leading tones, and Tri-Tone Substitution. Mr. Moody's book gives clearly written directions of the various techniques,followed by bass clef progressions that detail the examples. All the examples are interesting and go beyond the usual straight 4 beats to the bar that unfortunately fill up many of the books that I've purchased. I can see that this book will end up as dog-eared and ragged as my copy of Simandl, from repeated use. 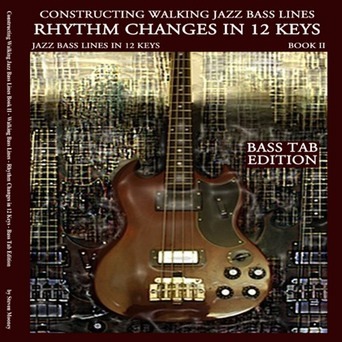 Also recommended in this series by the same author is: "Constructing Walking Jazz Bass Lines, Rhythm Changes in 12 Keys," ISBN 9780982957028, $19.95. Additionally recommended is "Constructive Walking Jazz Bass Lines Book II, Bass Tab Edition," ISBN 9780982957035, $19.95. "A must have". The Rhythm Changes in 12 keys ensures preparation for the mastery of the jazz language.Particularly,the Bebop and beyond language. Bar none, Mr Mooney clearly lays out how to walk the walk and talk the talk!! If you are an absolute beginner this book will be pretty challenging; you might want to look at Ed Friedland's book instead. But if you have some basic familiarity with walking bass lines and want to take your playing to the next level, this is the book for you. Well worth the price. Book two of Constructing Walking Bass Lines is on rhythm changes. The great thing about this series is the emphasis put on playing in every key, which is necessary for any jazz musician. Like book one of this series, book two provides many common ways to approach constructing a walking bass line. Part one breaks down the structure and form of rhythm changes by section. There are examples of all of the common ways to approach rhythm changes, the various chord substitutions that you will encounter and provides you with the smoothest voice leading variations possible. Part two focuses on the A section of the progression. Common progressions are covered here using the various devices covered in the previous chapter. The third chapter is focused on the bridge section. It also covers secondary dominant and substitution chords that can be used as well. Part 4 is rhythm changes in 12 keys implementing all of the techniques and devices demonstrated in the previous chapters. Playing through this book will improve any advancing bass players technique and fluidity on the instrument by light years. This book demonstrates all the common ways to play rhythm changes that you will encounter. It provides the bassist with many tools to approach constructing an interesting and creative accompaniment to the tune, while at the same time improving your endurance, time, and leaving the door open for you to be as creative as you like by using any combination of the numerous devices demonstrated. I would advise bass players of all levels to play through this book.